Created by pro session musicians and new for 2018, receive 60 custom JamTracks (with stems included) and 2 new Lick Packs. This music is deceptive - though the progressions and rhythms may look simple at first, this genre is great practice for anyone who’s a fan of intricate guitar parts and soaring harmonies. Jam along with pro musicians as you expand your country playing vocabulary and inject new inspiration into your playing. 60 custom JamTracks along with 2 Lick Packs featuring 40 videos. Create your own mix with seperate files for drums, bass, and guitars. Author narration to highlight the focus and purpose of each track. Master documentation including description and chord progression. We are digging deep into some Traditional Country sounds with this lick pack. Playing Country Music on the Acoustic Guitar gives you the opportunity to work some percussive and driving elements into your style. Use this resource with the accompanying rhythm tracks to strengthen the foundations of your playing by connecting to the roots of Americana. These licks gently cross over into Bluegrass, Blues, Folk and Rock and Roll. Learning licks is a great way to sound like a pro while improvising. By imitating what legendary country players have done, you can analyze and build your own vocabulary as a guitar player. With the included JamTracks in this pack and the rest in the Country Bundle, you have a great opportunity to invigorate your country soloing. This pack focuses on acoustic country licks that work well in the open position as well as up the neck. The licks were selected to be approachable for both beginners and veterans alike. Just speed them up or slow them down depending on your skill level. Here's a primer to help build your Country Guitar vocabulary. Playing country music on the electric guitar gives you the opportunity to use material that you might know from other genres and spice it up with some colorful bends, slides, and chicken pickin'. Use these licks and the accompanying rhythm tracks to take a wild ride to the Country side. Learning licks is a great way to sound like a pro while improvising. By imitating what legendary country players have done, you can analyze and build your own vocabulary as a guitar player. 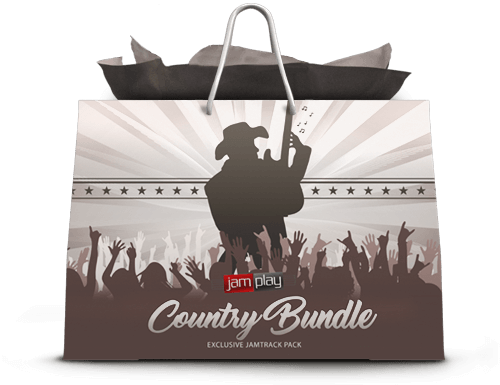 These country licks sound great over the included JamTracks in this pack and the rest in the Country Bundle. Grab your tele and invigorate your country solos now. Chicken Pickin’, fast runs, big bends and more. These hot country guitar licks are a great way to imitate country legends such as Roy Nichols, Albert Lee, Joe Bonamassa and more. If you like your rock ‘n roll with a touch of Southern twang, you’re in the right place. This 20-song set of original tracks explores all corners of the happy marriage of country and rock music. Jam along with pro session musicians as you expand your playing vocabulary and inject new inspiration into your playing. Add some grit to your sound and jam to these Country Rock tunes. These JamTracks are a great way for you to implement new licks, develop your phrasing, and hone your musicianship. Great for country players of all skill levels, these tracks come with a plethora of supplemental content including stem tracks, narrated guide tracks, select example solos and more! If you’ve got a little honky tonk in your heart, you’ll love this pack. We cover the history of acoustic country over 20 engaging and authentic tracks. Created by pro session musicians, these tracks are great for jamming and practicing at any level. Ditch the amp and grab your favorite acoustic, we are heating things up with some acoustic country tracks! These JamTracks are a great way for you to implement new licks, develop your phrasing, and hone your musicianship. Great for country players of all skill levels, these tracks come with a plethora of supplemental content including stem tracks, narrated guide tracks, select example solos and more! Put on your boots and fire up the truck - we’re heading to Nashville to explore the fun arrangements and killer grooves of modern pop country. This music is deceptive - though the progressions and rhythms may look simple at first, this genre is great practice for anyone who’s a fan of intricate guitar parts and soaring harmonies. These 20 original tracks are written in the style of today’s country legends, and are sure to take your playing to the next level. These 20 original tracks are written in the style of today’s country legends, and are sure to take your playing to the next level. These JamTracks are a great way for you to implement new licks, develop your phrasing, and hone your musicianship. Great for country players of all skill levels, these tracks come with a plethora of supplemental content including stem tracks, narrated guide tracks, select example solos and more! Select the Country Bundle at checkout and get it for free. Own it for life. Limited Time only.